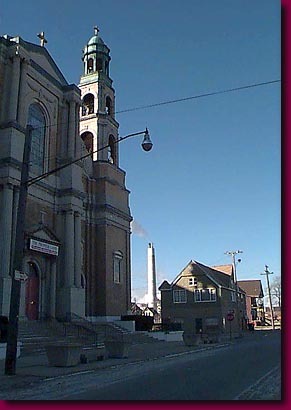 Our Lady of the Incinerator, the spire of the former St. Stanislaus Cathedral parallels the stack of the world's largest incinerator. The 1970's brought oil price shocks that wreaked havoc on a complacent Detroit automobile industry and economy. A rush to move to alternate forms of energy combined with a need to solve solid waste disposal problems, led to the proposal to build a trash-to-energy incinerator. Over much protest, the world's largest trash incinerator was built in the heart of Detroit. Its smoke pattern fell largely on a declining neighborhood just to the east accelerating the neighborhood's decay.